☀This early educational toy allow your kids to be in touch with music and colours. 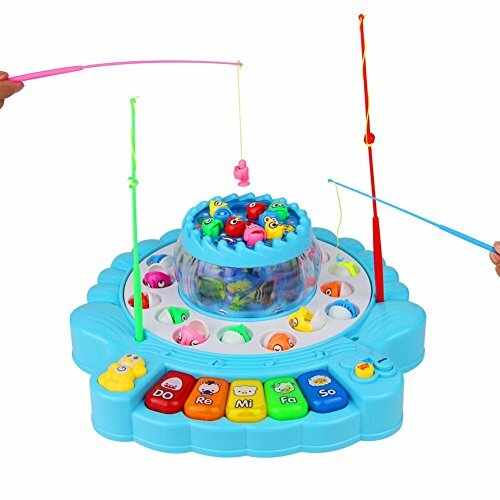 The fishing toy contain 2 kids fishing pond，4 toy fishing rod and 26 toy fish. ☀The toy fishes have 2 different expression,as if you can tell they are happy or not,super cute. ☀The musical toys sings a birthday song and the other five songs : small apple/variety Little Princess/Where is the father/kitten/small rabbit obediently. ☀This magnet fishing game also serves as toddler musical toys,there are total five modes you can choose to play with the piano key. ☀You can buy this musical activity toys as a special gift for your little one.